There’s a reason that a band like Journey can not only survive for 30 years, but also still play arenas. Simply put, they’re a damn good band. Going in, I honestly expected a limp going through the motions schmaltz fest. However, I was wrong. The guys in Journey decided to shake up the set list and dig deep into their catalog to unearth even some pre Steve Perry tracks. 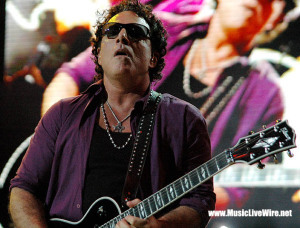 Midway through the show the band performed the bluesy “I’m Gonna Leave You” and “Mystery Mountain.” Guitarist wiz Neal Schon tore through solo after blistering solo the entire night seemingly demanding recognition as one of rock’s elite guitar players. He even led the crowd through an amazing take on “The Star Spangled Banner” that had the audience placing hands over hearts and basking in the red white and blue stage lights. What would a Journey show be without the hits that everyone in the crowd wanted? The band didn’t skimp on those 80’s rock radio staples. However, they saved most of them for the end of the set. “Don’t Stop Believin’,” “Anyway You Want It,” “Open Arms,” and “Lights” were almost all back to back before ending the main set with “Separate Ways.” It was almost too much rock to take. The crowd danced in the aisles, slow danced with their significant others and just generally had a great time. The band encored with “Lovin’, Touchin’, Squeezin’. It’s amazing that the band still has the passion to play these big hits that they have to be sick of by now. Journey is one of those bands (like Styx) that’ll surprise you. They’re incredible musicians that have been around long enough to know how to put on a truly entertaining show. If they’re in your town, don’t let the 80’s stigma throw you, these guys can rock.